Indonesia's Kawah Ijen volcano, located near the eastern tip of Java island, is a relatively ordinary volcano by day. OK so it's kind of terrifying, as most volcanoes are, but there's nothing about it that outwardly separates it from any of the other hundreds of volcanoes in this island country. To learn why, you'll need to head to the base of the volcano just after midnight, and hike up and into the volcano's crater. It's no easy task—you'll trek more than four miles and ascend to heights of nearly 10,000 feet, with only the light of the moon to guide you—and that's if it's out. You'll also need a gas mask: When you begin your descent into the crater, toxic sulfur fumes blow over you, marring not only your ability to breathe but also your visibility. (It's for this reason that you should also probably bring a local guide with you—but more on that in a minute). Around the time the clock strikes three or four, you'll have arrived at the bottom of the crater, and laid your eyes upon one of the most alien sights on our planet: Blue fire spewing out of the ground! The vibrant blue hue of these flames, which results from heavy sulfur deposits in the volcano, is best seen during the darkest part of the night, hence your needing to wake up long before the crack of dawn. As you continue marveling at the azure beauty unfolding in front of you, you might notice dozens or even hundreds of men around you, moving feverishly—and without gas masks. These are sulfur miners, residents of small villages around the base of the volcano, employed by the Chinese company that owns the mine. Think your trek was difficult? The miners carry approximately 88 pounds of powdery, toxic sulfur at a time, in two baskets connected by a beam of bamboo and suspended over their shoulders, over the same distance—and probably faster than you walked it. They also earn less than $7 (yes, that's U.S. dollars) for their effort, in spite of the fact that sulfur has an extremely high commercial value. The miners won't mind you being there (although, again, you should probably take a guide) but it's customary to tip them 10,000-20,000 Indonesian rupiah so they can buy cigarettes—smoking is their favorite creature comfort, which is perhaps ironic given the damage the sulfur fumes almost certainly inflict upon their lungs. Hopefully, in the future, local people won't need to do this backbreaking work, and the only reason to go down into Indonesia's blue-fire volcano will be tourism. When it comes to guides, several Indonesian companies offer tours, but the best way to go about seeing the blue fire of Kawah Ijen volcano is to hire a local guide. One highly-recommend guide is Sam from Ijen Expedition, a young man who resides in the Taman Sari township at the base of the volcano. Sam is not only passionate, professional and fluent in English, but invests proceeds from his tours into education in his village, which will decrease the dependency of locals on mining jobs, ultimately increasing the quality of their lives. 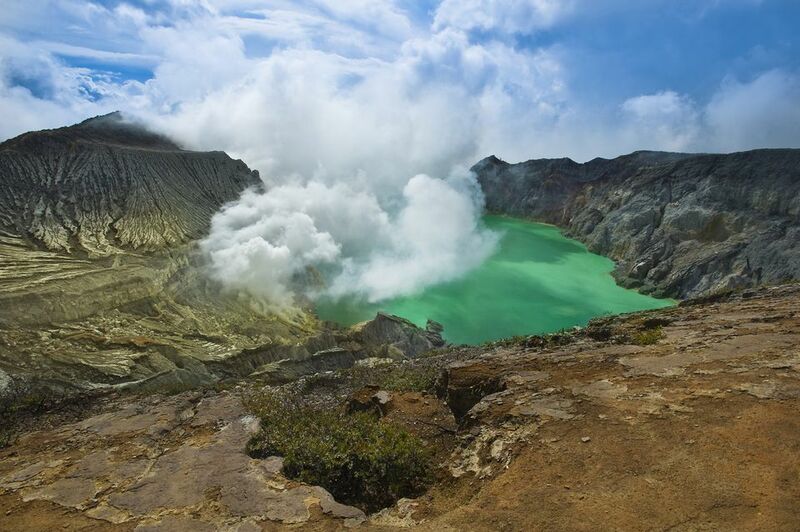 One day, he hopes, there will be no sadness felt at Kawah Ijen volcano—only amazement! As far as how to get there, you have a few options. Blimbingsari Airport near Banyuwangi has recently opened for limited flights, but if you aren't able to get on one of those, you have two relatively easy options. The first is to fly to Denpasar Airport in Bali, Indonesia's busiest tourist hub, then take a ferry over to Java Island, which drops you directly in Banyuwangi for easy pickup by your guide. The second option is to fly to Surabaya, the second-largest city in Indonesia, and the then take the approximately six-hour train journey to Banyuwangi from there. No matter how you arrive to Banyuwangi, make sure to keep in mind that your trek will probably start around midnight. While some tourists prefer to arrive around this time and get right to it, others prefer to get there early in the morning and spend the entire day resting in preparation.